The majority of students using CAPS only make one visit (VICTOR XU/The Stanford Daily). This article is the second in a mini-series examining Counseling and Psychological Services (CAPS) and how it has responded to increased community scrutiny. Stanford’s Counseling and Psychological Services (CAPS) provides all students who have paid the Campus Health Service Fee with access to a mental health evaluation, counseling services and a medical evaluation, at no additional charge – but with a caveat. CAPS is a short-term counseling resource, meaning that students who require long-term therapy will be referred to a local clinician. Many students face significant challenges in securing the long-term care they need as they navigate considerations such as insurance coverage and transportation. According to Vaden Health Center director James Jacobs, counseling is provided for a limited duration in order to ensure that all Stanford students have access to mental health services. If CAPS provided long-term counseling, the staff would not be able to take in new clients. However, the common belief that CAPS has a hard visit limit is merely “an urban myth,” Jacobs said. CAPS counselors will work with students for varying durations to identify what resources they might need for a longer term and make a referral. CAPS’ short-term counseling services seem to address the needs of the majority of Stanford students. 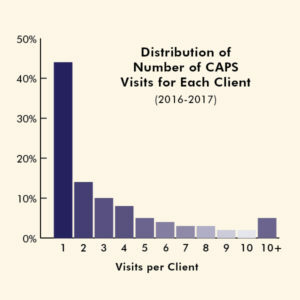 In fact, 44 percent of students who use CAPS only have one appointment, and 81 percent have five or fewer appointments. In its 2016 Annual Report, the Center for Collegiate Mental Health (CCMH) states that 132,597 students had counseling appointments at CCMH’s member institutions in the 2015-16 academic year. The most common number of appointments per client per year was one, and overall clients averaged 5.84 appointments. “I think there’s a fascinating story there,” Jacobs said. He is currently proposing a summer study to better understand why the majority of students at Stanford use only one or a few appointments. He speculated on a number of possible explanations: Students may feel better after one session, too overwhelmed to seek help at that time or dissuaded from returning to CAPS after learning what therapy is like. Jacobs hopes that the study would also help CAPS design more effective services for that majority of students using only one counseling session. He said a first appointment is generally an intake meeting focused largely on data collection and understanding the student’s history. “If 50 percent of our patients can get something useful out of one or two visits, [we should] actually build a system around that,” Jacobs said. For the minority of students needing long-term counseling services after working with CAPS, however, finding the right practice can be difficult. According to Jacobs, one challenge is finding a practice that takes the student’s insurance and has an opening. Even if a student has great insurance, he said, sometimes there aren’t any available practices in the area that take it. A junior who wished to remain anonymous spoke to The Daily about the difficulty of finding an off-campus option after using CAPS for a full academic year. Because few practices accepted her insurance, she only had three options for psychologists nearby. She recently stopped seeing the clinician, but she hopes she can find someone else. The challenge of finding nearby care can be even greater for those students seeking specialized services, such as students in the LGBTQ community. According to Inge Hansen, who manages the Weiland Health Initiative, a partnership between Vaden Health Center and the LGBTQ Community Resources Center, nearby counselors trained in serving LGBTQ-identifying students are limited. “We just don’t have a sufficient number of clinicians in the community who have that background and training, especially around trans identities,” Hansen said. Students seeking long-term counseling may also struggle to finance their services. “If you start seeing somebody, even in the department of psychiatry on campus or in the community, almost every insurance is set up so that there is a copay for each visit,” Jacobs said. Some students won’t want to use their insurance to prevent their parents from finding out details about their medical needs, while others may not have insurance at the time of their counseling need. In these cases, students are left paying high service fees or seeking out sliding-scale clinics. Transportation also presents a logistical and financial barrier: Students without cars may have to navigate the public transportation system or pay for ride-sharing services. The anonymous junior said she was “pretty lucky” in finding a therapist on Hamilton Avenue, a 15-minute bike ride from Stanford’s campus. However, transportation was still a challenge. According to Jacobs, both transportation and insurance coverage difficulties contribute to what he sees as the primary challenge in referring students to an off-campus service: student willingness. Even after students are successfully referred to an off-campus resource, not all will follow up with their new clinicians. The anonymous junior was one such student who felt disappointed upon learning CAPS had to send her elsewhere. About 10 percent of responding students connected successfully with the clinicians to whom they were referred, Wilkinson said. Another 10 percent followed up but had difficulty connecting, while the other 80 percent did not act on their referrals, although 40 percent of that group expressed plans to follow through eventually. CAPS staff are working to address the biggest barriers to accessing off-campus counseling services for students. First, they are trying to build more student support into the referral process. Currently, not every student meets with a referral coordinator, who is available to students to help navigate insurance and finances, transportation needs and what to expect when securing the first appointment. Hansen said there are steps CAPS can take to increase the likelihood of a successful referral connection, including talking to the student about what to expect during the initial phone call and brainstorming questions for the student to use to determine whether a therapist is a good fit. Sometimes, CAPS calls clinicians to tell them in advance about a referral in order to increase the likelihood that the clinicians will return students’ calls quickly. Another approach CAPS is taking to mitigate referral challenges is fostering relationships with therapists in the community. Several times a year, CAPS sponsors a luncheon with Palo Alto and Menlo Park therapists and CAPS counselors. In addition, CAPS is constantly working to “fine-tune [its] relationship with the department of psychiatry,” Jacobs said. “When resources are so limited, building those relationships is helpful,” Jacobs said, explaining that if the community counselors know the CAPS counselors who are referring students to them, they may be more likely to take on the new clients. Hansen is also piloting a program through the Weiland Health Initiative to train CAPS clinicians, community clinicians and those in the department of psychiatry in serving LGBTQ students. These trainings are available at low or no cost and last a full day or two so that counselors “can really bring [themselves] to the next level of competency in this area,” Hansen said. The group also checks in with community clinicians throughout the year to ensure that they have the most updated list of those counselors with training or a background in serving LGBTQ students. Additionally, Jacobs and Hansen believe that CAPS could increase the number of successful referral connections by increasing its number of follow-ups with students. Jacobs noted that following up with students could ensure that if a student doesn’t connect with their new clinician, it is by choice and not because of accessibility issues. For example, if a student reports that finances or transportation ended up being too big of a barrier in using the off-campus counseling service referred, a referral coordinator could work one-on-one with the student to go through other options.